Elise and her friends enjoy an evening of dancing and good cheer. The last person in the house finally gets to bed — lights out, and thoughts start to go into neutral. Gradually, our breathing relaxes, and we slip into a sleepy world of dreams and subconscious. There's another rhythm of the house - Elise and friends are just now falling into it and starting to reset from their last event. It's Valentine week, and Elise has promised she would dance in the moonlight. There's the rustle of tulle, the pitter pat of little paws and the more than a few giggles as the audience and talent take their places. The house settles into its evening rhythm, our dreams ebb, and tide and it's show time in the doll room. The music is enchanting, and before you know it, it's applause, applause, applause... or was it just sweet dreams playing with our past and present. Thank you, Elise, as ever, so beautiful, so sleepy, so happy. 1964 was the last year for Elise in this more familiar mold and body design. She was about to graduate in 1965 into a more long neck and straight torso design. Elise had also grown to 18 inches, from her debut in 1957 of 16 1/2 inches. Now that the Alexander Doll Company was strongly moving from hard plastic to vinyl, this Elise head is vinyl. The popularity of ballet in America was still huge, and it was growing in its influence in fashion. Audrey Hepburn was one of many influences in this trend. A former ballerina herself, her iconic "Funny Face" dance sequence in black leotards and black ballet flats helped bring ballet in another form into mainstream fashion. The ballerina length for dresses was another popular inturpitation of the movement of ballet into fashion. The 1964 Elise has the familiar Elise hard plastic head mold now translated in vinyl. Audrey Hepburn, a former ballerina, contributed to the huge popularity of the ballet at this time in her costuming in FUNNY FACE. The ballet flat and leotard were influences of ballet culture and costuming on the world of fashion. A strong mid-century reference to ballet in this dropped waist, ballerina length interpretation of a tulle tutu. New at the time, the ballet flat is a classic, and still a popular style today. 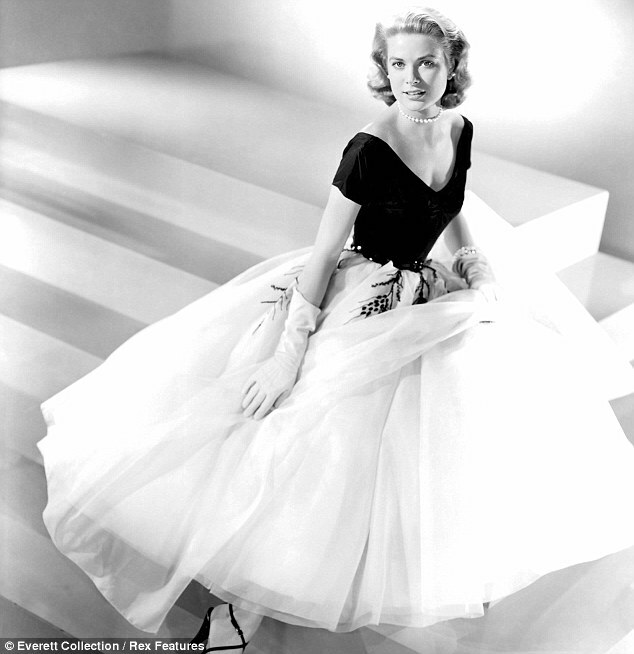 Hollywood embraced the popular mid century ballerina length in fashion for Grace Kelly. The romance and magic of ballet. The virtual effect created by point-work and the impression of weightlessness and floating on stage. The visual creation of time, place and mood are all part of the transformation of this glorious spectacle charged with emotion. Mid century America became the innovator for moving ballet from being severely selective to a more embracing media with new energy and talent coming from Russian, landing in New York and emerging with a unique new passion and point of view. Elise 1957 rare lavender Ballerina No. 1636 - dancing into a Valentine moment. 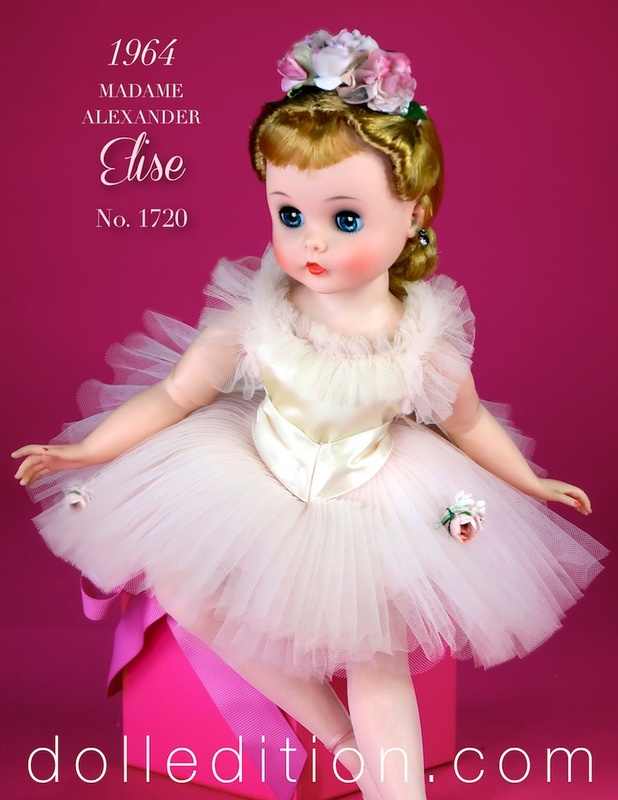 Madame Alexander found ballet and the ballerina a perfect subject to be interpreted by her doll company. Elise was truly unique with her flexible ankle joint and possible legs and arms. Ballet class became part of the American experience - even translated into fashion with it's demi longueur 3/4 length gowns. Tea length dresses are one of the lasting images of this period in our visual history. Ballet created new celebrities and theatrical experiences that would move into the new arena of television. Dance for us Elise... a silent grace and gentle expression makes for a romantic Valentine moment. Elise 1958 Ballerina No. 1715 in both pink, and in white - both mint in box. The Elise Ballerina... Alexander needed the right model and voila - Elise was created with adjustable ankles to accommodate a huge trend sweeping the country. Not only as a doll, but fashion was gobbling up elements of ballet costume design into couture fashion. Not only the ballerina length (3/4 length or tea length), but tulle and the ballet slipper were huge. The leotard used for practice became very fashionable too, especially when Audrey Hepburn, a ballerina herself, wore one in the 1957 movie (Think Pink!) Funny Face. Choreographer Balanchine remade American Ballet in his own image and classical Russian training — very thin and very young ballerina's were now in. Elise was the right doll at the right time. Audrey Hepburn, previously a struggling ballerina, helped Hubert de Givenchy translate many elements of ballet into his own designs. While Givenchy custom designed all of Hepburn's Paris wardrobe for the movie, Edith Head, darling of Hollywood studio costume design, got the Oscar. Hepburn got Edith Head replaced in favor of Givenchy after the opening costumes were already in production — one of fashions most famous collaboration of muse and designer was born! Jacqueline Kennedy was a huge fan of Audrey Hepburn and Givenchy, and wore his clothes — even having her signature designer Oleg Cassini copy line for line some of Givenchy's designs. 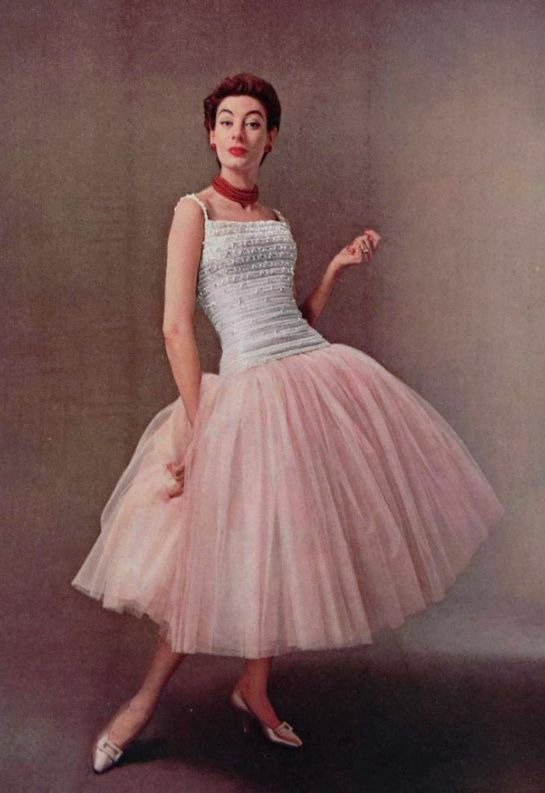 1958 Elise in a very romantic and beautiful interpretation of the American ballerina by Madame Alexander. Wearing the classic tutu, ballet costumes swung wildly what was in the mode of the moment. Nylon tulle was just becoming widely available and in many colors. Little girls, brides and prom dresses would be affected for decades to come. Loves Greetings to y'all! MADAME ALEXANDER'S 13" 1991 Pierrot Clown #1558 dancing with this stunning mint in box pink Elise Ballerina with a Marybel face — infatuated and floating on a cloud of marshmallow hearts — cherry flavored of all things! Pierrot is the endearing, but forever sad and pining in love clown. Made fun of, tricked, forever in love and always loyal. For centuries his interpretation has evolved over time and by nations, as they but their stamp on his image and character. A favorite figure in literature, art, plays, poetry, pantomime, ballet and even a few rock stars. Originating with Italian roots, our buffoonish anti-hero struggles for a place in life. Arriving relatively late in America, it was the late nineteenth century that Pierrot became the adopted image of a clash of changes running through the country. The fin-de-siècle world in which this Pierrot represented was clearly at odds with the reigning American Realist and Naturalist movement. In the last year of the century, Pierrot appeared in a Russian ballet, Harlequin's Millions, its dancers the members of St. Petersburg's Imperial Ballet. This would set the stage for many more productions featuring Pierrot - strongly reinforcing the ballet connection. America's love affair with ballet and the ballerina has been part of MADAME ALEXANDER'S product collections for what is now close to the century mark — in its many variations-on-a-theme. This enchanting Marybel face is an example of a transitioning out of hard plastic and into vinyl, joining their competitors in featuring vinyl dolls. At the time vinyl was the cutting edge technology du jour, and the next big thing in the extreme competition for durable dolls. Celebrating the New Year with dolledition.com is a pas de deux with Elise in gold - No. 1835 from 1961. Elise will dance into 2015 for us at dolledition.com - and so far so good! More familiar is her sister from 1959, Elise gold ballerina No. 1810. The 1961 version is more obscure with it's delicate interpretation using accents of pale pink roses. Thank you Elise for helping us into the new year - a new year full of new dolls, new adventures and challenges. The New York Toy Fair, where many of the dolls of the Alexander Doll Company have debuted for generations, is around the corner. The first of the Madame Alexander Premieres (madc.org - February 19-21) is taking place in Fort Lee, New Jersey following on the last day of Toy Fair. The 2015 MADC Convention is in Dallas this year. I'll be announcing soon, first through madc.org, a very special Cissy Designer Event tied into the Dallas 2015 Convention. I'm chairing the 2015 MADC Fall Friendship Luncheons, with a one of a kind "family" of dolls I'm designing. Their story is very interesting and may catch you by surprise. This is the beginning of a very big New Year for dolledition.com, with some very interesting vintage dolls waiting their turn to be showcased. Challenges keep it interesting and inspire new discoveries. I sincerely hope you will be along with me to make this journey into this exciting new year of 2015! Elise, 16-1/2" hard plastic with posable vinyl arms and adjustable legs and ankles - quite a bit of engineering for one doll! Barbie, just introduced in 1959, was making it challenging for the other doll manufactures to compete. These wonderful dolls of the golden era of the Alexander Doll Company were not in demand like they were in the 1950s era of dolls.